Betty Larsen-Knudson did such a fine job of recording the early history of the Morgan church for the 100th anniversary that I have left much of her information “as is”. I have then added further information that I have found in my research – taking special care to add “tidbits” that help identify family connections that I am aware of. I would also like to thank Betty’s cousin, Viola Benson-Mosier for providing Betty’s history to me. Betty was the daughter of Ernest Larsen and Viola the daughter of Amelia Larsen-Benson. Additional historical information was gleaned from the 50th Morgan Anniversary History, written by Esther Larsen-Read, long-time Press Secretary for the Morgan SDA Church. Esther was a sister to Ernest and Amelia and, therefore, an aunt to Betty and Viola. Thanks ladies! “The Danish Adventists began holding services at the house of James Sommer in the fall of 1872. The services were conducted by the Rev. J. F. Hansen.” – History of Redwood County, published 1916, pgs. 356-357, Re: Brookville Township. The story of the Morgan church starts in the earliest days of Seventh-day Adventism in Minnesota. A church had been established at Golden Gate (see history of Golden Gate Church) in Brown County and, originally the church was comprised of English-speaking folks. Over the years, however, as the Golden Gate Church grew, a Scandinavian (mostly Danish) segment of the membership arose who were from Brookville Township in Redwood County about twelve miles to the west of Golden Gate. In those days, a twenty-four mile round trip was quite a distance to have to travel by horse and buggy or sleigh. And so it was, that this group from Brookville determined that they would like to establish their own church home. On December 27th, 1885, 17 members of the Golden Gate church asked to be given the privilege of organizing a new church body nearer to where they were farming in Brookville Township. The next year, in 1886, as summer commenced, the Minnesota Conference met for it’s twenty-fifth annual session, traditionally held in conjunction with camp meeting – this year’s camp meeting being held at Lake Harriet, in the city limits of Minneapolis. During the conference proceedings held the evening of June 27, the Brookville Township (Morgan) church was admitted to the conference (Review and Herald, July 27, 1886). One can imagine what an exciting day that must have been for the little Scandinavian group to finally have a church group of their own! Betty Larsen-Knudson recalls her grandparents (Jens Christian Larsen and Paulina Jensen-Larsen) memories of those days when they did not have districts and district pastors – sometimes they would go for years at a time without a visit from a minister. Her father, Ernest Larsen’s, (son of Jens and Paulina) family remembered the minister getting off the train at Gilfillan, and walking three miles to their home to spend the night. Then Grandfather Jens Larsen would take him by horse and buggy to another Adventist’s home where the process would be repeated. In those early years, the Brookville Adventist congregation worshipped in the church known as the Brookville Lutheran Church located about 7 miles south and 1.5 miles east of Morgan (this building was later moved to Evan and eventually the church dissolved membership in 1961). The church was built around 1899 by the Lutheran, Baptist and Adventist congregations and all three denominations shared it for several years. Around the early 1890’s, though, many of the Adventist believers again moved west and north and felt it was too far to drive the horses which had toiled in the fields all week – the round trip averaged about fifteen miles on Sabbath. So, for some time, services were conducted in the homes three Sabbaths and in the church the third Sabbath of the month. Around the turn of the century in 1902, however, a new town to be called Wayburne was platted about 3 miles south and 1 mile west of Morgan along the railway (railroads being an important mode of transportation at that time) and the Adventists were given lots on which to build a church. The Adventists kept their end of the bargain and erected a church in 1902 at Wayburne. The record of this event is very brief, stating on March 29th a committee consisting of Elder Peter A. Hanson (a son of Danish immigrants and a native of the Morgan area), William Abraham Engelrup (a son of Danish immigrants who had moved to the Morgan area from Wisconsin around 1885), and H. P. Nelson was appointed to investigate the possibility of building a church and then, on June 30th, a business meeting was held in the church. No mention is made of the cost but the late Mr. Hans Mortenson stated that it cost about $300.00 to build the church. In the Morgan Messenger of June 5, 1902, it is noted that the church was dedicated June 8, 1902 with Elder Lewis Johnson of Lincoln, Nebraska, preaching the Danish and Elder J. F. Pogue, a minister from the Minnesota Conference, preaching in English. Church officers at the time of the building were Peter H. Christensen, Leader (a Danish immigrant, his daughter Emma married William Engelrup); Jens Christian Larsen, Deacon (a Dane who immigrated in 1885 and ancestor of all Larsen members of the Morgan church); Jens Johnson, Treasurer (a Danish immigrant also known as Jens Monko); Peter L. Gardner, Mission Secretary (son of Danish immigrants); and Mrs. J. H. Gardner, Clerk. Sabbath School officers were not recorded. What a joy it must have been for them to have their church nearer their homes! During the times that water prevented their use of the church, they, again, started meeting at homes with the children sitting on the edge of a bed for Sabbath School classes. The town of Wayburne never did flourish and eventually met it’s demise – no doubt the wet terrain accelerating it’s failure! Through the years the Brookville group had seemingly moved “from pillar to post” as they met in homes of the members, school houses, and different church buildings. All of this was about to change in 1916, however, when Hans Mortenson (a Danish immigrant) and his wife, Nellie, donated some land to the church that was located on the northeast corner of their family farm which was about 2.5 miles south of Morgan. The church building then in use at Wayburne was moved to this lot on the Mortenson farm – Brother W. A. Engelrup was the head of the committee to move the church. That must have been an awesome task to move the entire building down the road to the new location. But the new location proved to be a much wiser choice of location than Wayburne and that made it all worth the effort. From that time on the Morgan group had a permanent meeting place. At that time it was also decided to change the name of the church from the Brookville Township Seventh-day Adventist Church to the Morgan Seventh Day Adventist Church for the convenience of the conference workers and visiting ministers. Somehow they couldn’t remember “the Brookville Church at Morgan” but, instead, called it the Morgan Church. Shortly prior to that another change had taken place. Most of the founders were Danish people and services had been conducted in the Danish language for many years but as they settled into the new century, they finally yielded to the English tongue, the last Danish clerk’s report being written in December of 1912. Unfortunately, indoor plumbing was not one of the improvements included, leaving the role of the “outhouse” intact! Bev Burghart-Peck recalls the treks through the snow in the wintertime to reach the outhouse facility – it’s not one of her favorite memories of the Morgan “country” church! The lovely improvements of the little country church still left one problem unaddressed, however – that of sufficient space. The little group that started with 17 members in 1885, had grown quickly to a congregation that left the little country church nearly busting at the seams. This was due in part to the large farm families that swelled the number of the congregation as each generation was added – families including names such as Larsen, Burghart, Englerup, Read, and Benson quickly filled the pews. Around 1956, an opportunity arose for the Morgan SDA Church to purchase the United Methodist Church in the town of Morgan. The structure was reported as being “in excellent condition, newly finished on the inside with Celotex planking and ceiling, good pews, covered with a life-time roof, and in good paint.” After some negotiation, a price of only $3,000 was agreed upon. With the acquisition of the new church, the Morgan SDA Church was able to provide a blessing to another church by selling the pews from the little country church to the Heron Lake SDA Church members who were opening their first church building. The little country church would also continue to provide further years of service for the Adventists as it became the district’s community services center. On May 11, 1957, the Morgan Adventists, with J. A. Nordstrom as their pastor, had completed the purchase and for the first time they were able to meet in their new church building. Pastor E. F. Finck from the conference office joined them as the guest speaker that Sabbath. For a time, the Methodists also met in the building on Sundays while they were building their new church but, with time, the Adventists finally had complete use of the building. The Morgan church which began with only 17 members now had a membership of 53 – these along with their many children would make good use of the new sanctuary. They had worshipped in homes, they had shared a church in the country with the Lutherans, they had built a church only to be flooded out of the location, they had literally moved their country church, and now, at long last, they were finally able to settle into a lovely house of worship that would serve them well for many years to come. What a blessing to have this beautiful and spacious new home in which to worship God! A High Day at Morgan – From far and near cars were arriving at the Morgan Seventh-day Adventist church Sabbath morning, October 11, for a very special day – doubly special – the dedication of their church building and the dedication of the Southwestern Dorcas Welfare Federation depot. To add to the beauty of the occasion the Lord dispelled the raw gloomy weather of the previous days and gave us one of those rare days of October, nature at her best. Following the Sabbath school, highlighted by a mission story given by O. R. Rees and the lesson study by L. H. Netteburg, the main auditorium was filled to overflowing as departments of the Sabbath school were dismissed and all gathered for the dedication service. The church building, located in an excellent neighborhood, and purchased from a Methodist congregation, was neat and attractive, nicely decorated with beautiful floral arrangements. Mrs. Lawrence Read, one of the long-time members of the church, gave a most excellent history of the Morgan church, vividly portraying experiences of the pioneer days and of God’s leadings which finally culminated in the purchasing of the building in the town of Morgan. The dedicatory sermon was given by R. H. Nightingale. C. H. Lauda led out in the act of dedication and the dedicatory prayer. Following the thank offering, Elder and Mrs. C. H. Lauda sang “Bless This House.” Careful planning on the part of the ladies of the Morgan church made the lunch hour a most pleasant occasion for all participants of their warm hospitality. A short but most interesting Dorcas Welfare Federation program was conducted in the church at 2:00 p.m. under the direction of E. F Finck. Mrs. Albin Thulin of Granite Falls, the Federation secretary, presented the statistical report of the Federation activities for the two previous quarters. Two of the vice presidents, Mrs. J. A. Nordstrom, and Mrs. L. L. Murphy gave interesting experiences of welfare activities in their districts. The history of the establishment of the first small welfare center of the Federation at Granite Falls which finally led to the purchasing from the Morgan congregation of their former house of worship two and one half miles south of Morgan for a suitable Federation storage depot was given by Mrs. Clifford Christensen of Pipestone, the Federation president. A stirring message by O. R. Rees presented a picture of the work and challenge of welfare activities. At 3:15 the meeting closed and all drove out to the welfare depot for the dedication service. All gathered on the lawn in front of the welfare depot for the act of dedication. The town clerk extended a warm welcome and the Redwood County Executive Secretary of Welfare expressed deep appreciation for the most helpful activities of the Dorcas in the community. Following an address by O. R. Rees and the dedicatory prayer by R. H. Nightingale, C. H. Lauda cut the ribbon and welcomed all to inspect the well-stocked bins and filled racks of the building. This building is to be a storehouse from which can pour clothing and bedding in times of emergency and disaster, the first Federation depot in the conference. All came under the influence of the Dorcas touch as they went through the back of the building and were given a luscious cup of punch and a tasty homemade cooky. Music for the various services of the day was rendered by the Morgan choir, young ladies of the church, J. A. Nordstrom with his violin, a group of boys from Hutchinson, and the Clifford Christensen family band. Present from the Northern Union Conference office were R. H. Nightingale, L. H. Netteburg, and O. R. Rees. C. H. Lauda, T. Irville Rush, and E. F. Finck attended from the Minnesota Conference. Betty Larsen-Knudson also noted as she was reviewing 1979 church minutes that the basement was later remodeled and the church was made more energy efficient. Certainly the Morgan group took a great deal of pride in their church home and ensured that God’s “house” would always be ready for His service! Through the years, Morgan members earnestly served God, whether it be a home meeting, a country church service, or a worship in the lovely new sanctuary they purchased in the town of Morgan. Such services often included beautiful music – a blessing that the Morgan church always seemed to enjoy. The church had many talented musicians through the years – the Burghart family was very musically talented, David especially played the piano well and later became a music teacher in SDA schools. Viola Benson-Mosier was also an accomplished pianist and provided music for the Morgan group for many decades – in fact, the last time this editor (Kathy Parker-Parke) visited the Morgan church in the early 2000’s (before it was relocated to Redwood Falls), upon arrival at church Sabbath morning, there sat Viola at the piano, still providing sweet music after all these years! This editor remembers that she made her own debut at the Morgan church when she played her first piano solo for a Morgan worship service. She also recalls her mother, Myrna Andersen-Parker, an excellent vocalist, singing for many services and funerals in the Morgan church. In addition to the lovely music provided through the years, Morgan also had a number of able pastors and laymen who provided meaningful messages for the parishioners and for evangelistic efforts held throughout the years. In the early years, such evangelistic efforts were often conducted by a traveling minister. As time went by, however, pastors were established in the district and parishioners became more involved in these efforts. On September 29, 1967, the Northern Union Outlook shared a report by Mrs. Merlin (Dorothy Kallemeyn-Burghart) of one such venture. Such endeavors often resulted in baptisms and the addition of new members to the church. Many individuals and families were added to the church over the years, which brought additional workers to God’s cause – these families included names such as Wally, Rudy, and Reinhold Kirschstein; and Frederick and Helga (Anderson) Parker with their son, Vernon – these joining in the ranks beside long-time SDA members such as the Burghart and Larsen families. While many baptisms were held at Minnesota’s annual camp meetings in the early years, baptisms were also held at the river on the Burghart farm or at other nearby SDA churches. Later, after a baptistery was installed in the church, most baptisms were conducted at the church. No doubt, one of the most memorable baptisms, however, was the occasion when Lewis Anderson, who had grown up in the Morgan church and later went to the seminary to study ministry, came “home” to minister to his own church. The event was reported in the January 14, 1966 Northern Union Outlook. With the older members setting an exemplary pattern, it was only natural that efforts would be put forth to also engage the children and younger members in Bible study. One of the surprising facts of Morgan’s history, is that, despite having large numbers of children over the years, at no time did the Morgan church ever have a church school. However, efforts were taken to address this need through a modified program of instruction as reported in the July 30, 1962 Northern Union Outlook by Mrs. Lawrence Read. The editor (Kathy Parker-Parke) recalls that, as a young grade school child, these meetings were a sweet time of fellowship and a welcome addition to the instruction of the public school system. The Bible stories were interesting and were accompanied by enjoyable activity workbooks. It is a testament to the faithfulness of these parents that many of their children became diligent workers in the church in later years. In their efforts to train their children to serve the Lord, the Morgan members also engaged in another endeavor which many Seventh-day Adventist churches had found to be a success in training their own children while witnessing to children in the surrounding community – that endeavor was Vacation Bible School. In 1958, shortly after the Morgan group had moved into their new church home, they decided to hold their very first VBS (Vacation Bible School). The Minnesota Conference sent Evelyn Jepson to head up the undertaking. The pastor assisted with story telling and music while some members helped as teachers and others assisted by babysitting for the teachers. The school ran for all-day sessions held over the course of four weeks. Students attended from Morgan, Lamberton, Sanborn, and some from as far as a 55 mile one way distance. The school, with a theme of “God’s Great Letter, The Bible”, was a grand success and closed on Sabbath, June 28, with a presentation at the 11:00 church service that included students reciting Bible lessons they had learned. After 1958, VBS was a regular summer feature for the Morgan SDA Church. In 1959, the Morgan church was ready to try a VBS with one of their own members as leader. Mrs. Ernest Larsen (Esther Kallemeyn-Larsen) led the school with an average attendance of 28. Children traveled from Springfield, Lamberton, Milroy, Fairfax, Hutchinson, and one was even from Milwaukee, Wisconsin. On Sunday evening, August 2, a graduation program was held with the children giving a brief review of what they had learned. After a few remarks from Pastor Jerry Coyle, the diplomas were awarded to the children as they marched to the platform. Everyone was invited to the church basement where a display of the various crafts and work books was shown and refreshments were served to over 80 guests. July 18-22, 1960, found Mrs. Orville Burghart (Lucille Battig-Burghart) of Morgan and Mrs. Darrell Anderson (Elaine Shellum-Anderson) of Lamberton directing Morgan’s VBS and these two talented ladies also directed again the next year for the June 26-30, 1961 school. This fourth VBS for Morgan in 1961 was reported as having 30 children attending, some of them from non-Adventist homes. Instructors included Mrs. Elmer Larsen teaching the juniors assisted by David Burghart (son of Orville and Lucille) leading junior crafts, Mrs. Joe Hale (Myrtle Larsen-Hale) taught the primary class while the bluebirds (the advanced kindergarten group) were taught by Mrs. Julius Larsen (Delores Kopischke-Larsen). The kindergarten class was taught by the pastor’s wife, Mrs. J. R. Coyle and Mrs. Richard Moots (Lullabelle Barker-Moots). The sixth Vacation Bible School at Morgan was held June 17-21, 1963, with Mrs. Joe Hale as leader and Mrs. Orville Burghart as assistant leader. The total enrollment was 39, representing six denominations, and including five sisters who were Sioux Indians. Three children, Mark Burghart, Ramona Burghart and Ralph Hale, had completed the entire course of study provided in the VBS series. Once again, the event was closed out with a lovely program attended by almost all participants. As VBS continued through the years, no doubt many children made fine Christian friends and were inspired to draw closer to their Savior. This editor (Kathy Parker-Parke) recalls her many good memories of the Morgan VBS … memories of Kool-aid and juice for mid-morning breaks, sandwich lunches shared with friends on the back steps of the church, and outdoor games enjoyed by all. Yes, these activities were “fun”, but most of all she remembers singing the joyous songs of praise to our creator and listening to the leaders share the lessons of Jesus’ love in an interesting and creative style. Certainly, the memories of the Morgan Vacation Bible Schools were an inspiration as Kathy later became leader of the Northome, MN Vacation Bible School, a position she maintained from 1973 when she was only 17 years old until 1989 when she relocated to Buchanan, MI where she again led out in VBS for a few years. We can always be assured that Jesus will attend our efforts for his little lambs and the work we do will often reach beyond our own communities, perhaps to other areas of the country or even to other areas of the world! Of course, through the years, Morgan’s efforts to reach out to the community have not been limited to Vacation Bible School! Community outreach has resulted in a variety of activities including five day plans to stop smoking, blood pressure screenings at the Redwood County Fair, several evangelistic crusades, literature distribution, and many other worthwhile projects. But there is no doubt that one of the most memorable community outreaches by the church has been the work done by the Community Services group or, as it was affectionately called in the earlier days, the “Dorcas” Society, modeled after the example of Dorcas in New Testament times. This group, organized by Mrs. Mildred Stanbeck about 1932 and usually comprised of the ladies of the church, has worked tirelessly to share clothing, food, and other necessities with those in the community in need of assistance. One of the activities that the Dorcas society undertook, was to engage in bake sales whereby they could earn funds to further assist those in need. Mrs. Lawrence Read told of the first Morgan SDA Church bake sale in the January 23, 1951 Northern Union Outlook. The Dorcas societies around the state were grouped into districts and these groups met several times a year to share experiences and encourage one another in ministry to their local communities. Morgan was often the meeting site for the Southwestern Dorcas Federation. In 1957, when the Morgan church purchased the building in town to use as their house of worship, it was decided that the old “country” Morgan church would make an excellent site for a district center for Dorcas activities. And thus it was that the Southwestern Dorcas Federation Depot, was created – or, as it was sometimes called, the Southwestern District Health and Welfare Service Center. This was the first federation depot to be established in the Minnesota Conference. The Federation executive committee met in the building, May 21, 1957, to plan for the necessary bins, shelves, and racks to be built to meet the needs, and to organize for operating the depot. They were soon prepared to effectively serve when emergencies and disasters came. This center served the needs of the community for many years. It was usually open to the public one day a month to provide for their needs. Of course, when disasters struck families or communities, the center worked many additional hours to help provide for needs in times of disaster. While there were several leaders through the years, some names that have been noted include Mrs. Julius Larsen (Dolores Kopischke-Larsen) and Mrs. Bud (Merlin) Burghart (Dorothy Kallemeyn-Burghart). Over the years, leaders such as these, managed a very active and prosperous group giving of their time and talents to help others. All in all, the Dorcas society was probably one of the most noted ministries to the Morgan community by the Seventh-day Adventist Church. A great many individuals were helped through this ministry and only in heaven will we truly know what a great blessing this group was for so many in a time of need! Each fall of the year the Northern Union Outlook would post the names of churches that had achieved their Ingathering goal and Morgan was often one of the first church names to be posted to the list. Certainly much humanitarian aid was made possible by the faithful Ingathering efforts of the Morgan congregation! In addition to the many excellent mission projects that the Morgan SDA Church supported, they also found time for fellowship and recreation together. Betty Larsen-Knudson reports that the first mention she could read of a church picnic in the church minutes from 1912 on was the picnic of July 4, 1917. Betty remembers as a child looking forward to this special day of fellowship with church family and friends. The annual church picnic was a practice followed for decades with the picnics usually being held around the 4th of July holiday. This editor (Kathy Parker-Parke) remembers attending the church picnics held at the Orville Burghart farm – she recalls the hayrides, the tire swing, watching the men play horseshoes, and the delicious creamy ice cream perched atop a crispy cone. Mrs. Lawrence Read, long-time Press Secretary for the Morgan church, reported in the August 13, 1963 Northern Union Outlook one such picnic for the Morgan church group. Other social activities for the Morgan church included music-talent programs in the church basement, holiday parties, and yummy potlucks hosted by the ladies of the church – usually in the church basement or in the park in Redwood Falls – most families being farm families with large gardens, the potlucks never lacked for an abundance of food! Sometimes an organized group such as the Dorcas or MV society would host a special event such as a banquet. Mrs. Lawrence Read reported one such event in the August 13, 1963 Northern Union Outlook. Certainly, many can recall a good many pleasurable memories of social times spent together with friends and family of the Morgan SDA Church and we can look forward to the day when we can be reunited on the heavenly shores to once again enjoy relaxing moments together! Periodically, social and spiritual events at the Morgan church would take in a larger group of their Adventist friends. Morgan was oftentimes the site of district meetings – meetings that would include all the churches served by their pastor. Churches involved would often include Lamberton, Heron Lake, and Pipestone – and, at times, other churches would be added to the list too. In the fall of 1944 it was reported that such a meeting was held for the young people. Again in June of 1949 it was reported that a district meeting was held with a Sabbath dinner in a grove and then, in the evening, at the Morgan City Hall, all gathered to watch a “sound” film – no doubt a novelty at that time! “The Morgan church acted as host to all of the Southwest District on Sabbath, November 26, as an Investment rally was held. Pleasant weather made a good attendance possible. It was an unusual privilege to have representatives present from both the General and Union Conferences. Elders J. A. Buckwalter and C. E. Guenther were with us for the entire day. Their timely messages were very much appreciated. Orville Burghart, the Morgan Sabbath school superintendent, arranged the program in such a way that one half hour could be used for an Investment program and reports from the other superintendents, who are as follows: Lamberton, Mrs. Howard Mace; Heron Lake, Mrs. Grant Schmidt; and Pipestone, Mrs. Clifford Christensen. These reports of Investment projects proved interesting and helpful as ideas were exchanged. All of the Investment money is not in as yet, but the total for the district now stands well over $600. Some members are already looking forward to Investment next year with a determination to accomplish even more. When we think of Christ’s investment for us, our best for Him is none too much. Elder Buckwalter drew a graphic picture of our day in the light of Bible prophecy as he spoke during the regular eleven o’clock hour. In this connection brief mention was made of intoxicating drink, as an introduction to his evening topic. Tables and a hot drink were provided by the members of the Morgan Dorcas society for all visitors. Following lunch the children and youth of Morgan presented an excellent program of songs and recitations under the leadership of Mrs Lawrence Read. It was then time for the children to listen as our visiting ministers told several stories. At 7:45 p.m. we met once more in the Morgan city hall for a temperance program. This meeting had been advertised in the newspapers and we were happy to have some of our non-member friends with us. The program was divided into two parts. A challenging lecture was delivered by Elder Buckwalter, followed by a sound motion picture film on temperance. As this meeting was dismissed by prayer, we were all ready to enter wholeheartedly into the recreation and fun provided by the Morgan M. V. society, under the direction of Mrs. Read. We want to thank all members who made this rally a success by their presence and contributions. Special thanks is extended to the Morgan church members for their excellent provisions as host.” Wow! Such an action-packed day must have left all attendees ready for a good night’s sleep!!! Other district meetings centered around welcoming new members into the church. District meetings often included several baptisms such as the meeting recorded on December 11, 1964 in the Northern Union Outlook. As the years rolled by and the Morgan church grew, they never forgot their roots and the story of how their ancestors had embarked upon a journey to establish a church that would primarily serve a small group of Danish immigrants. They remembered the struggles to erect a church building of their own, only to be met with the challenge of a water-logged location. They recalled moving the church to a new location, later meeting the challenge of outgrowing the building by relocating to the beautiful facility in town. They knew that God had been leading each step of the way. So it was only natural that members would reflect periodically on God’s leading of the Morgan through the years. 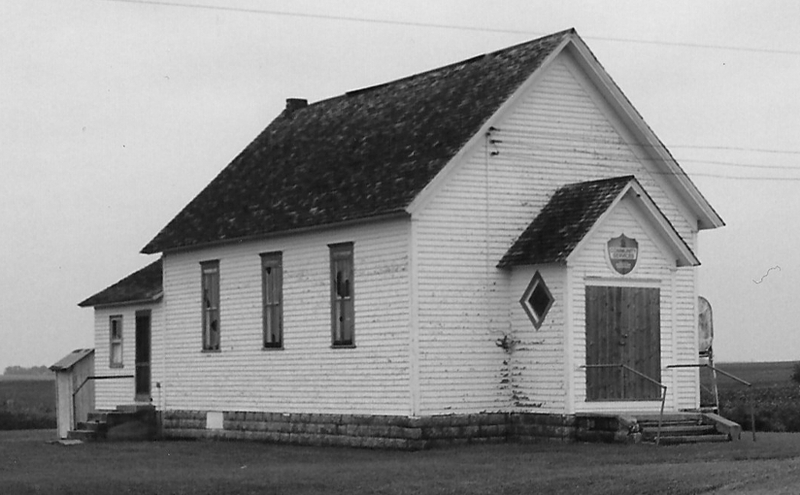 On November 15, 1952, Morgan celebrated 50 years in their country church – the church that was built in 1902 and later relocated to the Mortenson farm. Elder and Mrs. E. R. Osmunson and the Maplewood Symphonette with their director, Milo Hill, added much to the program of the day. James Mershon, pastor of the church, and his family were also present and he offered a re-dedicatory prayer. The membership of the church in 1952 was forty-four. Twenty-one of the young people from the church had attended SDA schools with seventeen graduating, two were attending Maplewood and one was at Union at that time. Six from the church had served in conference work. A history of the church was given by a daughter of one of the charter members, Christian Burgeson (father of Vernon K. Burgeson, a well-known SDA pastor in Minnesota), who was then residing in Redfield, South Dakota, and was the only remaining charter member of the group when it was organized in 1885. Not long after this, the village of Morgan was celebrating its 75th anniversary on Sunday, July 27, 1953. Since the Morgan SDA church had just observed its 50th anniversary, after some consultation with the Minnesota SDA Conference office, it was determined that this would be an excellent opportunity to highlight the work of the Morgan SDA Church in the community by entering a float in the parade on Sunday. The weather was perfect and a very large crowd gathered – estimates ranging from 12,000 to 20,000 people gathering to celebrate. The SDA church chose to picture a home seventy-five years ago, showing the family gathered in the evening with the mother playing hymns on an old organ. The floats were announced over the loud speaker and one of the church members heard someone say, “Seventh-day Adventists, who are they?” A local man standing near by informed them. The next day one of the local Adventist businessmen was surprised to receive in his mail a check for $10 with the notation “fourth prize.” All the other floats winning had quite elaborate trimmings and must have cost a lot to decorate whereas the SDA church had spent only $2.30 for materials – but the theme of the float had struck everyone as unique and in keeping with the theme of the anniversary. Literature had been prepared by J. M. Mershon bringing forth the difference in homes of today and seventy-five years ago and this was circulated following the celebration. The Adventists had used a celebration of history as a unique tool to witness to their community. A couple decades later, on Sabbath, December 31, 1960, the Morgan congregation celebrated the 75th anniversary of their organization. Membership had grown to 52 and the congregation was being shepherded by Pastor Jerry R. Coyle. The attendance for the 75th anniversary was more than double the usual attendance. Services began Sabbath morning at 10:00 with Mrs. Orville Burghart (Lucille Battig-Burghart) as the Sabbath School Superintendent. O. R. Rees, of the Northern Union, was the visiting speaker at the worship service. Following lunch, the special commemorative service was held. Several of the older hymns were sung and then the names of the 17 charter members were read. Mrs. Lawrence Read (Esther Larsen-Read), whose mother, Mrs. Jens Christian Larsen (Pauline Jensen-Larsen), was one of the 17, presented a history of the church which she gleaned from old church records, personal interviews with others, and recollections of childhood experiences in her mother’s home. Special mention was made of Mrs. J. C. Larsen because she was the youngest member when the group was organized and she was the only charter member to spend her entire life span in the Morgan church. At the 75th commemoration, those with the longest memberships in the church were noted as being Amelia Larsen-Benson who was baptized in 1903, Luella Mortensen-Larsen (daughter-in-law of Amelia), Ernest Larsen, Elmer Larsen, and Esther Larsen-Read (the last three being children of Amelia). Elder Rees closed the service with a challenging message. Certainly the congregation must have felt blessed after reflecting upon the Lord’s leading of the Morgan church through the years! Another 25 years had elapsed, when current and former members and pastors again gathered to celebrate the 100th anniversary of the Morgan SDA Church on September 21, 1985. Church started at 9:00 a.m., followed by Sabbath School at 10:00 a.m., and a potluck at noon. In the afternoon a program was conducted, again highlighting the story of the church and the way that God had led the congregation through the years. Betty Larsen-Knudson had compiled a history of the church which she shared during the service, noting that through the years the congregation had stood fast and the members still looked forward to that same joy and blessed hope of the charter members back in 1885. Betty shared that her grandmother, Pauline Jensen-Larsen was one of the 17 charter members and she was a lifetime member of the church for sixty years. At the time of the 100th anniversary, the only members left who were direct descendants of the charter members where Julius Larsen, Larry Reed, and Viola Benson-Mosier, all being grandchildren of Pauline Jensen-Larsen. Once again, the congregation had been reminded that God watches over his flock and leads them through whatever challenges time brings. In addition to the members who have served the church through various capacities, many grandchildren and great-grandchildren of members have also blessed the church with their service – Vernon K. Burgeson (son of Christian Emil Burgeson, one of the charter members) was a beloved pastor in Minnesota for many years; grandchildren of Jens and Karen Mortensen (the “original” Mortensen family at Morgan) have taught and worked in various SDA Church capacities; Wesley Anderson (son of Lewis Anderson, Sr. and Alice Benson-Anderson) has three children, Clinton, Kim Wooster, and Curtis, who are teachers in SDA schools and he has three grandchildren, Melissa, Heidi, and Greg Anderson who have a lovely music ministry and some who have worked in SDA schools; Carol Jourdan worked as Girl’s Dean at Maplewood Academy (Carol is the great-granddaughter of William Englerup and great-great granddaughter of Peter Christensen, the Head Elder when the “country church” was built) as well as Carol’s daughters, Mandi Jourdan-Kutschara who has served in SDA schools including Maplewood Academy and Chelsy Jourdan-Schauer who has ministered with GYC, Wisconsin Academy and Maplewood Academy; Richard Parke (grandson of Vernon Parker) has led in various ministries at Andrews University including the Easter Passion Play and currently is the Director of Media Ministries at Pioneer Memorial Church in Berrien Springs, MI … the list could go on and on, no doubt! Suffice it to say, that the faith and service of those early members lives on years and decades after they have passed to their rest.